It's been a long weekend and unfortunately school doesn't take into consideration my busy life so I'm just now getting around to writing about it. It's been quite exciting really and overall I can say it has been a very good past few days. I think I'm beginning to realize its not just the ocean that has you learning new things everyday. Life seems to be throwing out a lot of unexpected stuff lately.Friday night my dad, Bill and I were at the Silent River Film Festival award ceremony. Wild Eyes was nominated for Best Documentary. 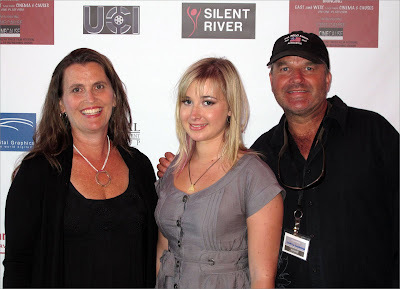 My dad won for Best New Director and I got the Silent River Film Festival Achievement award. After that we hopped into Bill's plane and flew up to Big Bear Lake for the Big Bear International FIlm Festival. We had a little cabin up there for the whole family and it really was great to get away with everyone for a bit. I think we all needed a break from the craziness of home, and what better a place than quiet, laid back Big Bear. Zac, Jordan Romero and I were part of the Young Adventurers Side Bar at the festival. After our doc's were shown, Zac, Jordan and I were up for questioning. It was good to see Jordan again. You may remember that Jordan is the youngest person to climb Mount Everest. He has actually climbed 6 of the 7 highest peaks in the world. He is hoping to conquer number 7, Mt. Vinson in Antarctica, this winter. Check out his web site and follow his adventures at www.jordanromero.com. I swear Jordan has grown a foot since the last time we saw him last summer. Later on in the afternoon came the awards. Jordan, Zac, Me, and a few other guys were presenting them and it all was just a lot of fun. We were taking our turns presenting awards and I thought we were finished and was heading out of the room when all of a sudden someone said "Wait Abby you're back up!" So out I was on stage with an award and a microphone in my hand... probably should have been paying closer attention to what they were dong on stage! Lucky for me the guy left his notes on the stand!! So it turned out that Wild Eyes won the Peoples' Choice for Best Documentary! Life really seemed to be falling back into an actually normal normal. I mean not just my kinda normal, but a typical 17 year olds' normal. Everything that happened on my circumnavigation attempt is so long ago now that I barely even think about it anymore. I'm just a 17 year old girl, going to college, hanging out with friends, doing everything that I should be. I was sitting out in the lobby and watching as everyone came out of the theater. It seemed like everyone was teary eyed; old guys, young guys, grandmas and moms. Then a little old lady came up to me crying. She hugged me and said that her husband froze to death a year ago. She said that that was her rouge wave and went on to say how my story had inspired her and that she knew that she could make it through this. At that point I think my eyes started to water a bit, and it takes a lot for that to happen. To me, my story might seem like old news, but to some people it's a story of hope, and courage, and to see how many people were moved by it made me do a double take on me and my normal life. Maybe it shouldn't be normal, because if my story was able to encourage that sweet little old lady then I want to make sure everyone that needs to hear it does. And as if just to confirm that, back at school on Monday, just sitting outside waiting for my class I ran into a guy waiting for his ride. A perfectly normal guy, you never would have guessed he was a basketball player with 50 scholarships who recently dislocated his shoulder, losing all of them, and moving out here just four weeks ago because of his dad's work. So that's life; rough times come, rough times go. As long as I'm around I'm going to do my best to give people hope that things will get better because, you know, they always do even if they have to get a little worse first. Now, back to the math homework! Things have been going well over here with the book and documentary. Wild Eyes, The Abby Sunderland Story (the name of my doc) has been accepted into a few different film festivals and was nominated as best documentary in the Silent River Film Festival. We'll find out if it won anything next week. You can watch the trailer for my doc and buy a copy at my web site at www.abbysunderland.com. We'll also be out in Big Bear at the Big Bear Film Festival this coming weekend. I'm really looking forward to that one because they have a whole side bar of young adventurers, including my brother Zac Sunderland, Jordan Romero and me. Jordan is the guy that climbed Mount Everest when he was 13 and of course my brother sailed around the world the year before me. 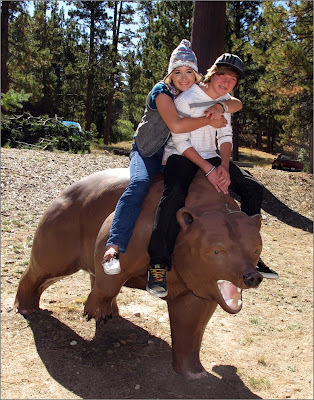 You might remember awhile ago Zac, Jordan, Joseph Machado, and I all got together in Big Bear and hung out for the day. It will be good to see them all again. So, if you're out around Big Bear this weekend, stop by and you can see all of our docs, meet some awesome people and have a fun time hanging out in the beautiful mountains there. The Young Adventurers Sidebar Showcase is on Sunday. 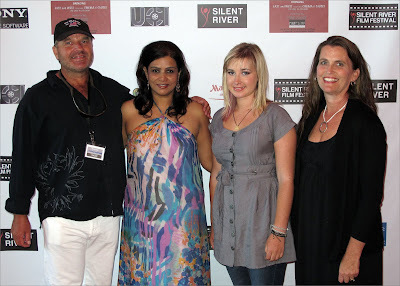 Go to http://www.bigbearlakefilmfestival.com/page.php?13 for more info. Tonight I am speaking at the Pacific Singlehanded Sailing Association in Marina del Rey. It should be a great time taliking to sailors and ones that know a lot about what my trip was about. Next weekend I will be at the Norwalk Boat Show in Norwalk, Connecticut on Saturday and Sunday. Then it is back to California and back to school. Life has been busy but I am loving it! It has been quite awhile since my last blog. Quite a lot has happened since then. I've been back to the East Coast to talk at summer camps, been to boat shows, done more speaking, kept up my flying, sailing, and trying to keep finding exciting things to do. The east coast was great. I headed over there knowing I would be speaking, speaking to kids, but that was about it. When I showed up there and walked into my first room of kids, it was pretty small, and the kids were pretty young, probably around 5 or 6 up to 10. Now, my talking had improved a lot by then, in fact I was getting pretty good at it, but I guess its somewhat like the ocean, right when you think you've got it figured out, you get thrown into a whole new game, and you realize just how far you still have to go. Now, if you want to perfect your public speaking skills, just try holding the attention of a room full of chatting squirming 5 year olds for more then 5 minutes! My week there went well, with the help of some awesome guys from the Coast Guard who were traveling around with me to help out. We managed to do a pretty good job entertaining just about every school and camp we went to. So, my next big adventure is starting tomorrow, college. Pretty scary thought, huh? Kinda sad, it feels a little like all of a sudden the next four years or so of my life are planned out, and it's all college. There's not much one can do to get around that. I'm hoping there will be room for some adventures and I suppose I'll have the summers to go off and find new dreams to follow and shake up the world a bit. A year ago today I was standing on the bridge of the french fishing ship Ile de la Reunion staring out into the pitch black night, mind spinning out of control. Everything that had happened...I just couldn't believe it. I wasn't sure where the ship was taking me, but at the time it was the least of my worries. Earlier in the day I had sent a blog home to my mom to post. It started off with a bad attempt at humor, saying "its been a crazy few days out here, the long and the short of it is, one long wave and one short, meaning a two inch stub of a mast." It wasn't funny, but at the time my choices were pretty limited, cry, or cry, or make a lame joke and pretend its funny. I went with the third option. On board the ship of scruffy fishermen, I was left to myself mostly. Several of them spoke pretty good English, but I didn't want to talk. My mind was drifting through all the memories of my trip, my team, my boat, my family... standing there in the dark for hours, thinking back to the terror of tying myself onto a broken stanchion with my saw in hand and working on sawing away my mast hoping I didn't fall off the pitching deck. When I had been on Wild Eyes, I worked hard to control my thoughts, never let them go too far, but now I didn't care. Zoning out as I stared into the dark, my mind was so far from where I was. I think I was worrying about what the fishermen on board were thinking as they probably weren't quite sure what I was doing just standing and staring. It wasn't just the bad things I kept going back to, in fact, it was almost more so the great times. All those amazing days racing along surfing down giant swells making record speeds. Sitting on deck with Charlie my stuffed pelican, watching the sun set, icy wind hitting you in the face, feet and hands numb from the cold, but an amazing sight that I got to see almost every night. The worst thing to think about was all those great times, they were all gone now and my trip was over, no more sunsets on Wild Eyes, no more surfing, no more world adventures. It was hard. But then again, just a day before I had sat wondering if I would be rescued... I didn't think I would be. I had come so close to death more than once during my trip. The fact that I was rescued from the middle of nowhere... it was crazy really. Just last week, I learned about a friend of mine that I met in Rhode Island when we bought Wild Eyes. He left on a solo sail, got into a storm along the way, and no one has heard from him since... ocean sailing is a dangerous thing, but so is life. With all the prayer and expert SAR crews, I have been given something that not everyone gets, a second chance. I could have easily died out there, just like so many others have, but I didn't. In one of the most remote places on earth I was rescued. Something through all of this that I learned, is that we all get hit by our own rogue waves in life. It's what we do with them that matters. You can take something that looks like a disaster and turn it into something great. You may support me, you may not, but as long as I live, I know I am going to take every opportunity that comes my way, chase every dream, and do all that I can to help others follow their dreams. I just wanted to make sure you all knew that I will be signing my new book Unsinkable today Saturday May 21st at 2:00pm at the Barnes and Noble in Westlake Village, California. I'm over in Annapolis, talking at schools and doinga few book signings. My life has been busy as usual. I'm kinda feeling like I did after being out at sea for a few weeks when all of asudden you realize that there is a new sort of "normal" to life. Flying around, speaking at schools, signing books, it all used to feel a little odd, but now it's just part of life. And as crazy as it's been, I'm having fun, lots of fun. I mean why not? Well, other then that I'm still terrified of public speaking and sometimes I just wish I could be out in the middle of the ocean alone again... But for the most part I'm just glad to see how well everyone has been responding to my talks. We got into Philadelphia Sunday night about 12:00am, but of course, being me, I ended up staying up till 4:30 finishing up notes and slides for my presentations the next day. I'm not sure there was much point in actually going to sleep as I woke up just half an hour later at 5... but at least I had everything ready to go. 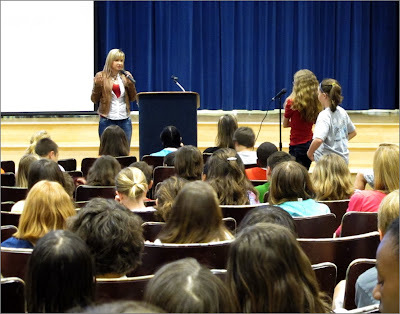 I spoke at three middle schools today, 6th-8th grade. Then did a book signing at Barnes and Noble. The kids were adorable, super excited about everything, and had tons of great questions afterwards. Kinda funny thing, a lot of the things that these young 12 and 13 year olds were asking were much better questions then I've gotten from big time reporters. What's that show called? Are You Smarter Than a Fith Grader? Well, I had to have a bit of a chuckle to myself thinking about that. All in all it was a great day and I'm looking forward to tomorrow! I'll be speaking at two high schools and then having another book signing at Borders in Waldorf, Maryland tonight at 7:00pm.